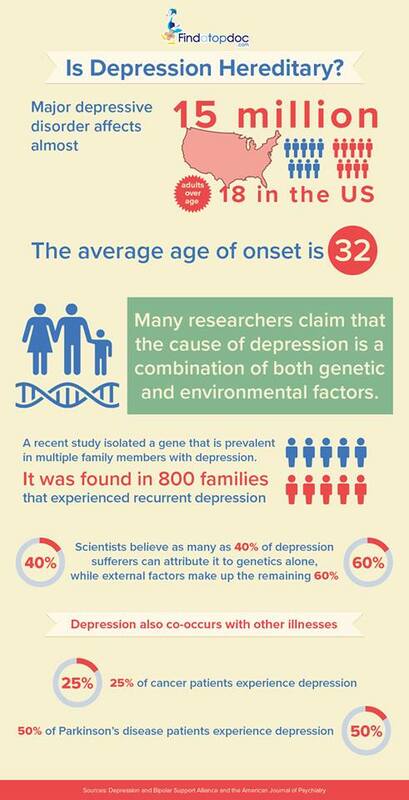 Home » Infographic: Is Depression Hereditary? 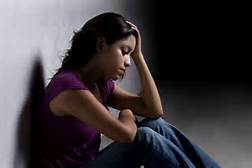 Depression is an emotional disease that affects an individual in a way such that the individual is unable to think and function in a normal manner. While many people who have not had a first hand experience dealing with this disease think it is a disease that is created, fail to understand that depression is a real disease which in many ways impacts the brain. WHO puts depression in the category of one of the most disabling disease that can affect men and women, young and the old as well as rich and the poor. – Any form of abuse: A past history of some sort of an abuse which could be physical, sexual or emotional could push one at the risk of depression later in life. due to disputes and conflicts arising between family and friends. – Personal loss: This is one of the most common problems associated with depression wherein one is unable to cope with the death of a loved one. Sadness and grief is natural however when due to this sadness one is unable to carry out a normal living, it is characterized as depression. – Genetics and Heredity: Although there are studies being conducted in this direction, but it is said people who have a family history of depression can be at an increased risk of this illness. ALSO READ: Is depression A Curable Disease? Is there a relation between Genes and depression? It is a well known fact that in a number of cases, depressions can run through generations in families. Although the types and triggers may differ but depression and its symptoms may be inherited. What is seen as inheritance of the disease is actually a biological vulnerability to acquire the disease when the genes interact with the environment or probable triggers. This is only a risk factor and does not guarantee that depression will happen to those who are related to persons suffering from depression. When a parent or sibling has depression, there are high chances of similar genes being present in children and the other sibling. There are a number of studies being conducted to identify one gene as a responsible factor for causing depression, however it so appears that there are multiple genes involved. Studies indicate that multiple genes act together with the environmental triggers leading to the development of clinical depression. result in some form of bipolar disorder. Largely close relations have higher chances of getting the depression genes rather than distant ones.